The producer Hynek Žalčík helmed the album’s origination and its Supraphon release by getting together young musicians and a blues poet just before his death. Messrs Fořt, Khunt, Kubík, Kulhánek, Mišík and Šedivý transcended the standard rock vocabulary in the direction of more colourful pictures, phrases and communications. 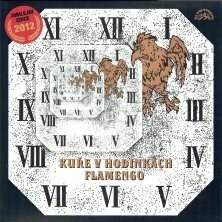 All this, as well as a series of splendid concerts, made Kuře v hodinkách (Chicken in the Watch) an absolute prog. rock phenomenon. This album is the starting point of Supraphon’s plans to rerelease the most interesting recordings from their large archive on LP. It offers excellent progressive Rock in the line-up guitar, keyboards, bass, drums, flute, clarinet and saxophone. For this record Supraphon chose 180 gram vinyl (the edition from 2013 is on standard vinyl) and designed a beautiful black fold out cover which is perfectly manufactured on a high quality 350 gram cardboard. They reproduced the front page of the original LP from 1972 – which had only a single cover – and added lyrics, photos and same basic information on three more cover pages.